sample from a vernal pool on the Mansfield campus. The Ohio State University at Mansfield believes that student experiences outside the classroom are just as important as the learning that goes on within. From research to internships, arts to athletics, and from studying abroad to leadership opportunities in campus clubs, students can choose the experiences that will provide personal development and prepare them for careers. Stephanie Brokaw, a sophomore at Ohio State Mansfield, was selected for an Undergraduate Education Summer Research Fellowship. With mentoring from Earth Sciences Professor Ozeas Costa, the Pharmaceutical Sciences major is analyzing the wetlands and vernal pools on campus to identify the organic matter and carbonate content. Two other current students will use their leadership skills to form a women’s support group on campus this fall, inspired by several speakers from a recent conference. Senior Tiffany Tilley and sophomore Maris Bucci attended the National Conference for College Women Student Leaders at the University of Maryland in June. It was the first time students from the Mansfield campus participated in the conference, according to Donna Hight, Chief Student Life and Retention Officer. “The women there were phenomenal. They were so high-spirited, outspoken strong women,” Bucci said. “It was awesome being a part of that and sharing it with other people who had similar interests as me.” Bucci is a self-described “involvement activist.” She is a Buckeye Ambassador, Campus Activity Board secretary, member of the Mansfield Mavericks volleyball team, president of Student Government, Camp Hetuck facilitator and is working at Buckeye Village as a leasing consultant. Tilley is also training to be a Junior Admissions Counselor in the fall. She has been part of the Haiti Empowerment Project study-abroad for two years and was a Buckeye Ambassador. Ohio State Mansfield connects students with paid internships in surrounding communities, too. Jessica Luna, an Accounting major, is a Human Resources Intern at OhioHealth MedCentral this summer. She provides a variety of duties for the director and vice president as well as participating in project development related to MedCentral’s integration with OhioHealth. “I think it’s unique that our students have the opportunity to intern locally with a Fortune 100 company like OhioHealth MedCentral (ranked in the top 100 Best Companies to Work For by Fortune),” said Tracy Bond, Internship Program coordinator. Happily, More than 700 people working and living in Richland County chose to participate in our survey, and the initial results are nothing short of fascinating! First, we have made some important gains in building our town-gown ties over the last several years, especially with sectors of the community that historically have been disconnected from our campus. Second, in many ways our best connecting points with the community are happening with and through our students! I will be providing a brief overview of the results for the Richland Community Development Group in early August, and then will be laying out the first full sets of analyses during a campus-wide presentation I will make during the common hour on Wednesday, Sept. 17. As dean, I’ve thought a lot about the relationships between universities and the cities where they live, and connecting these relationships to my own research interests in family dynamics. I discovered that town-gown relationships and marriages share a lot in common. The vows that state “for better or for worse, in sickness and in health,” and so on, are an applied fact of life for any college town. During the presentation, I will define the four distinct types of town-gown relationships – devitalized, conflicted, traditional, and harmonious – and where respondents tell us we are in these relationships. I’ll also reveal where respondents think we are in terms of the level of comfort and level of effort of our relationship. This is one presentation you will definitely want to attend! Students participating in Camp Hetuck learn team-building and problem-solving. These students must learn to adapt to an ever-shrinking group footprint. The Ohio State University at Mansfield is known for its friendly caring attitude and those qualities show from the minute new students commit to “Buckeye North” and continue through their first year and beyond. In fact, that strong foundation towards building student success is one reason students decide to stay for a second, third, and four year with us. Natasha Stouffer, Admissions and First Year Experience coordinator, says the goal is to try to help students through different stages of development, both academic and social. Ohio State Mansfield offers many opportunities to smooth the transition to college life. Admitted students become Buckeyes at Orientation. They experience college traditions, receive their BuckID and leave with their first schedule of classes. Sessions for parents include financial aid, health insurance, safety on campus and how to be a part of their student’s success during the first year. “Orientation also serves as the venue for new students to meet their new collegial classmates,” said Collin Palmer, Admissions counselor. Student Welcome Leaders play a large part in making the new students and parents comfortable. At orientation, students also learn about other pre-enrollment programs like Camp Hetuck, SMART and First Generation Connection Learning Community. Admissions counselors at Ohio State Mansfield also act as First Year Experience counselors. “As an Admissions counselor, I get to know prospective students and they know I will be there with them throughout their first year,” Stouffer said. FYE spans pre-enrollment through a student’s first year of college. Pre-enrollment is about breaking the ice and getting rid of some of the myths that students might have about college, according to Stouffer. Engaging students becomes a campus-wide initiative. Activities such as the Buckeye Book Experience, Success Series and Convocation provide further engagement. During the first semester, it’s all about making connections. Students who feel connected to their campus within the first six weeks are more likely to stay, according to Stouffer. During the second semester, that foundation is built upon. “At this point we want them to take the positive experiences they felt in their first semester and take more of a leadership role to continue the cycle,” Stouffer said. Ohio State Mansfield’s Camp Hetuck, in it’s 10th year, is one of the most prestigious campus events for new students. Sixty new students and a dozen student facilitators who are past participants converge in July for two days, including an overnight in Molyet Village student housing, to learn leadership skills. 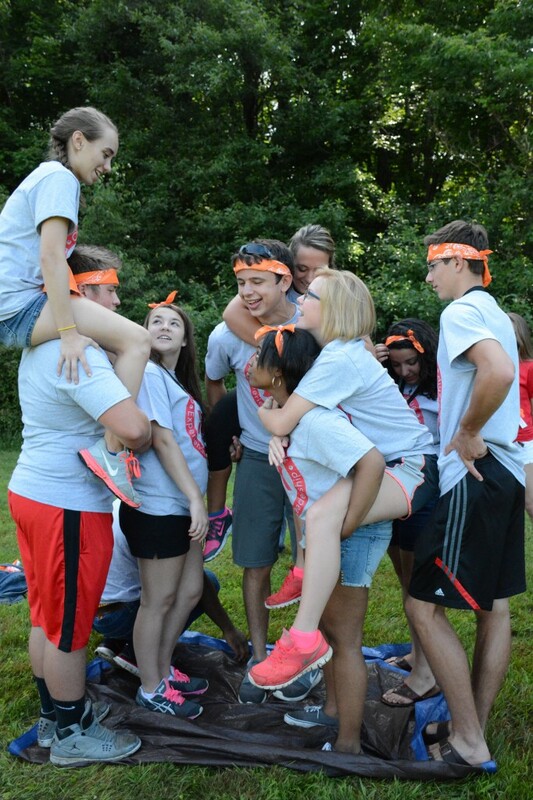 Teams of upper class leaders partner with new students to participate in competitions and games but also to have some serious conversations about leadership. “What ends up happening is that you have students who have never met each other and within two days they are sharing things that they would only share with their most intimate friends,” says Matthews, who is also a facilitator. Students Making a Realistic Transition is designed for students of color and for those who feel they might be challenged in making the transition to college, according to Renee Thompson, Office of Diversity and Family Engagement. A two-part session titled Be the Difference introduces students to community services and activities. Thompson also offers a one-credit Seminar for Students of Color that anyone may take, which explores diversity. Ohio State Mansfield has a large first generation college student population, according to Stouffer. Twenty students are accepted into the program each year. They participate in group activities during Welcome Week and attend at least two classes together as a group. During the second semester, they engage in a service-learning project.